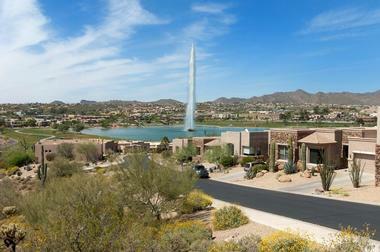 Fountain Hills, AZ is located near Scottsdale and the Fort McDowell Yavapai Nation reservation. The destination is best known for its downtown geyser fountain, the fourth-tallest public fountain in the world. The 18.2-square-mile town enjoys a warm, sunny desert climate year-round and is home to a variety of recreational and cultural attractions, including theatrical performing venues, parks and botanical gardens, and art galleries. Fountain Hills Botanical Garden is an eight-acre public botanical garden owned by the city of Fountain Hills, showcasing nearly 30 varieties of plants unique to the American Southwest desert region. A loop trail traverses the garden’s landscaped areas, stretching approximately half a mile throughout the facility. Scenic rock formations are also showcased, along with information on the growing habitats and characteristics of the highlighted plant species. The park is free and open from dawn to dusk daily and serves as a popular spot for birding in the Fountain Hills region. Informational brochures about the gardens are available from the park’s central kiosk. 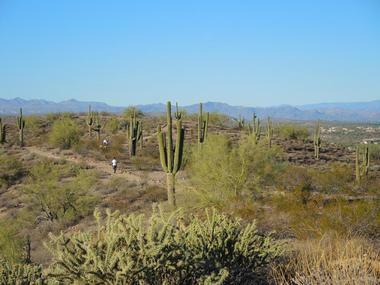 McDowell Mountain Regional Park is a public park spanning more than 21,000 acres throughout the northern Fountain Hills region, offering opportunities for a variety of seasonal outdoor recreational activities. The park is located along the western edge of the McDowell Mountains, with elevations throughout reaching a maximum of 3,000 feet above sea level. More than 50 miles of multi-use trails are available for hikers, mountain bikers, and horseback riders, including three loop tracks of varying difficulty levels available for use by competitive-level mountain bikers. 76 campsites provide tent and RV hookups, offering picnic tables, fire rings, and public restroom and shower facilities. 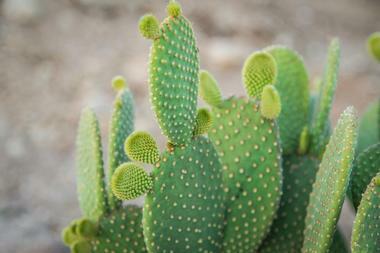 Wildlife sightings of deer, coyotes, and javelina are common throughout the park. 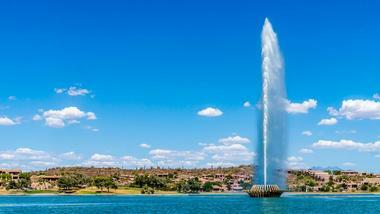 The Fountain is a 560-foot geyser-style fountain in Fountain Hills’ downtown center, originally constructed in 1970 by Robert McCulloch. 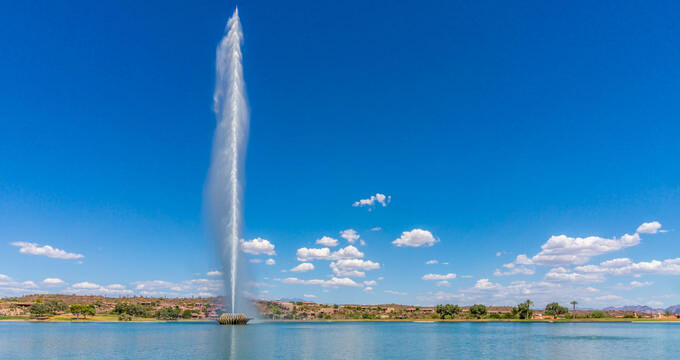 The structure is one of the world’s largest man-made fountains, reaching water heights three times higher than Yellowstone Park’s famed Old Faithful geyser. 7,000 gallons of water pump through the fountain per minute as it spouts from a concrete water lily sculpture, with water plumes visible from as far away as the Superstition Mountains region. It serves as a major community landmark and public gathering space, spouting at 15-minute intervals on the hour daily from morning through evening. On special event days, the fountain’s height and viewing schedule are adjusted for broader operation. Fountain Hills Lake Overlook Trail is an urban multi-use trail that spans 1.5 miles throughout the heart of the Fountain Hills community. The family-friendly hike begins at a public parking lot and trailhead near Fountain Lake and Panorama Boulevard, traversing uphill through a condominium development area that offers beautiful lake views. As the trail ascends, 360-degree views of the area’s surrounding vistas become visible, including the Superstition and Mazatzal Mountains, the Four Peaks, and Mount Ord. After the halfway point, the trail continues through residential areas and loops back to the intersection of Palisades and Saguaro Boulevards, which provide access to Fountain Lake’s southern end. Dixie Mine Trail traverses the grounds of the former Dixie Mine, which was originally established in 1877 for the purposes of mining quartz. The mine continued to operate throughout much of the 20th century until its sale to McDowell Mountain Regional Park in 1977. Today, its remains can be explored via a 5.5-mile round-trip within the park that stems off the Sonoran Trail, gaining 591 feet in elevation before reaching its destination. Above the mine, petroglyphs from the Archaic, Hokoham, and Historical periods are visible, along with stone carvings believed to date between 1918 and 1925. Visitors should note that a nominal fee is charged to access the trailhead. 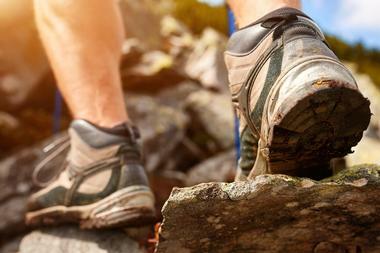 The trail is dog-friendly and is recommended for intermediate-level hikers. 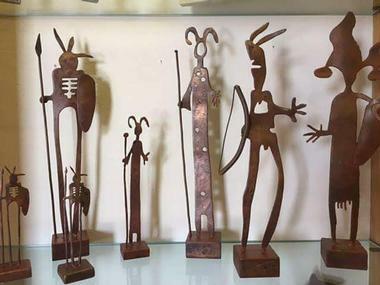 Fountain Hills Artists' Gallery is an artist-owned cooperative gallery that showcases the works of more than 40 artists from throughout the Fountain Hills region working in a variety of mixed media. The gallery is operated daily by artists, allowing visitors to meet the creators of works on display with every visit. 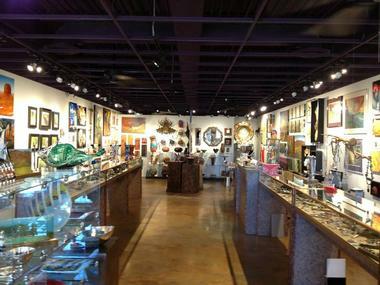 Mediums on display include acrylics, ceramics, fiber art, glass, jewelry, photography, oil paintings, and sculptures. 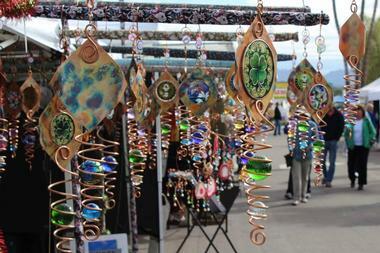 Specialty works are also displayed periodically, including gourd art, kaleidoscopes, encaustics, and silk scarves. All items are available for sale as a direct purchase between artists and customers, with no gallery commissions taken. Monthly workshops are offered for amateur artists of all skill levels, with all supplies included for participants. Fountain Hills Great Fair of Arts and Crafts is an annual fine arts festival that is held for three days in February in downtown Fountain Hills. The festival has been presented for more than three decades and attracts over 500 artists and crafters from around the United States and the world, exhibiting in a wide variety of mediums. In addition to artwork for sale, many vendors engage in the tradition of offering custom holiday ornaments available for sale, crafted to their unique styles and artistic voices. More than 200,000 annual visitors attend the festival, which also offers live music performances, food trucks, a beer garden, and public seating and dining areas. The festival is held rain or shine and offers free admission, with ample free parking available. The River of Time Museum is an archaeological and anthropological museum that showcases the civic and social history of the Fountain Hills region, from its indigenous roots through the present day. The museum was opened in 2003 by the Fountain Hills Historical Society and strives to educate visitors about the various peoples of the Lower Verde River Valley, with a specific focus on the Fort McDowell Yavapai Nation and the Verde community. Exhibits include the Building a Fountain, Building a Community exhibit, which focuses on the development and construction of the town’s iconic fountain, and the Three Communities, Three Sources and Ancient Lower Verde Civilizations exhibits, which highlight the region’s indigenous groups. Other exhibits showcase topics such as the area’s mining history and the development of the Phoenix metropolitan area Salt River Project. Group tours are offered for small groups of 10 or more, and special events are held periodically, including dinner discussions and Thursday Theater performances. Fort McDowell Casino is a state-of-the-art gaming, dining, and entertainment complex, offering an award-winning 1,200-seat bingo hall and more than 900 slot and video machines, along with blackjack tables and a poker room showcasing daily tournaments. Five restaurants are also offered on site, including the throwback Silver Platter diner, sushi and noodle joint Noodles Sushiya, and the resort’s famed all-you-can-eat Red Rock Buffet. Overnight accommodations are offered at the four-diamond Wekopa Resort, and RV hookups are available at the Eagleview RV Resort. 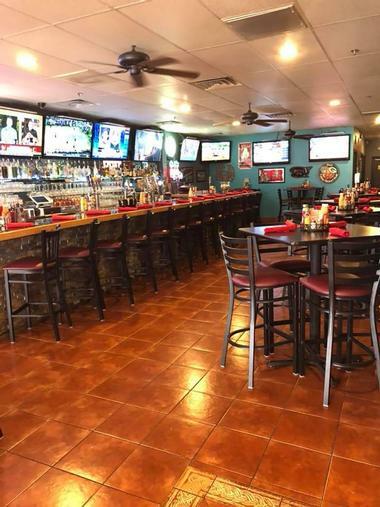 Live entertainment is also showcased on weekends at the Lucky 7 Saloon, showcasing the talents of regional bands such as Mogollon, Furious George, and The Hamptons. Grand Canyon Winery is a privately-owned boutique winery operating out of Wilcox, founded in 2011 by the Martinet family. The winery produces high-quality wines from hand-picked grapes sourced from five vineyards throughout the Cochise County region, prepared in the tradition of fine French winemaking. Popular wines for sale include the winery’s 2014 Cochise Valley Vineyard Petite Sirah, 2013 GCW Zinfandel, 2014, GCW Desert Blessing Grenache, and 2014 GCW Sangiovese. An intimate tasting room is offered for wine tastings and flights, also serving a variety of local microbrew draft beers. 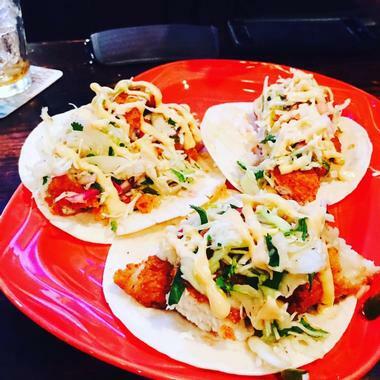 Karaoke and live music are offered throughout the week, along with daily happy hour deals. A wine club also allows customers to receive a variety of selected wines throughout the year, along with exclusive discounts on tasting room purchases. 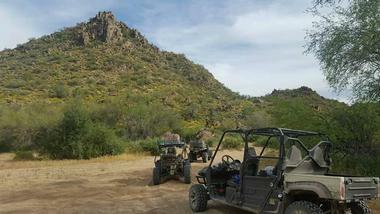 Desert Dog Hummer Adventures offer first-class desert tours throughout the Sonoran Desert region, including a variety of 4X4 and Hummer excursions. The company has been operating out of the Valley of the Sun for nearly two decades and has been featured on the Travel Channel as one of the top tour companies in the Phoenix region. Top tours include H2 Hummer excursions, which offer tour experiences in fully air-conditioned environments with roof-mounted spotlights. ATV, four-wheeler, quad, and two-seat desert buggy tours are also offered, traversing some of the region’s most challenging desert trails. Tours are offered seven days a week, departing at several times throughout the day, and may be customized for small groups and organizations. Combination tours are also offered, along with barbecue tour packages and team-building programs. Chocofin Chocolatier has been crafting world-class chocolates since 1998, overseen by Scottsdale resort chocolatiers Denise and Louis Mirabella. The small-batch chocolate company uses high-quality chocolates in an exclusive bean-to-bar roasting and baking process, with all sorting, winnowing, grinding, and conching done in house. Unique chocolate flavors include passionfruit caramels, blackcurrant marzipans, Vietnamese cinnamon crisps, hot chile truffles, and a variety of liquor-infused candies. Sugar-free chocolates are also available, along with nut barks, toffees, and chocolate bars. Berto’s Gourmet Gelato is served at the company’s public cafe, along with homemade cake slices in flavors such as chocolate bourbon pecan pie, hazelnut espresso torte, mixed berry streusel, and tiramisu. Saddle Bronc Grill is a Western cuisine grill and bar that has been owned and operated by Brad and Barb Tesch since 2009, when the couple took over the former Two Step Saloon facility. The restaurant serves a wide variety of classic American and Southwestern comfort fare, with selections such as John Wayne Angus cheeseburgers, pan-fried walleye, and slow-roasted prime rib prepared in house daily. A large selection of local craft microbrews are available on tap, and an extensive wine list highlights regional varietals. Large-screen televisions showcase major sporting events, and happy hour specials provide discounts on appetizers and drinks. 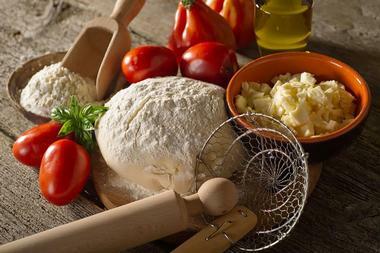 Sapori D'italia was opened in 2009 by Sicily natives and New York City transplants Gasper and Maria Manno, who bring an extensive restaurant management and culinary arts background to the Fountain Hills region. The restaurant has been featured on the television show Restaurant: Impossible and is known for its authentic Sicilian fare, including a wide variety of wood-fired pizzas. All pastas are made fresh daily in house, with Parmigiano Reggiano cheeses and San Marzano tomatoes imported from top Italian producing regions. A custom-built stone pizza oven is displayed at the restaurant’s pizza bar, allowing diners to watch pizzas being created. Phil's Filling Station Grill was opened in 1997 by Phil Rodakis and strives to create a mid-century American vibe inspired by Rodakis’ work as a teenager at his grandfather’s Bronx diner. The restaurant’s operations emphasize fresh ingredients, affordable prices, and friendly service, with more than 250 unique menu items available, including a variety of classic 1960s-era throwbacks. It has been the recipient of a number of local awards for best breakfasts, best local burgers, and best desserts, serving up diner favorites such as omelets, deli sandwiches, and barbecue ribs. Restaurant decor includes Coca-Cola memorabilia and a New York Yankees-themed dining room, with nine high-definition televisions provided throughout the restaurant for viewing major sporting events. On Sunday afternoons between October and May, the restaurant hosts Cruisin’ at Phil’s drive-in events, showcasing area owners’ classic cars.